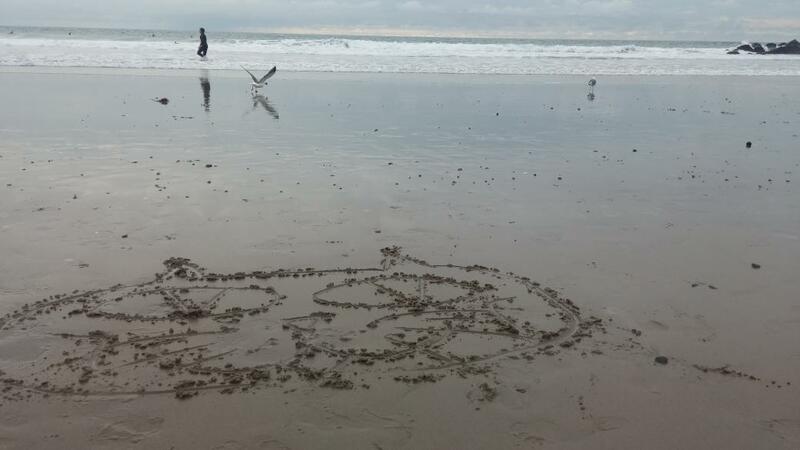 @haha1549 tweeted picture of her OKCat and BEF. Did you sew that BEF? Cute! 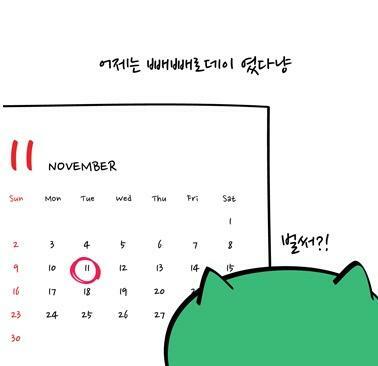 OkCat Twitter, Thursday, Nov 20 at 10:37am [TST] 11:37am [KST]. 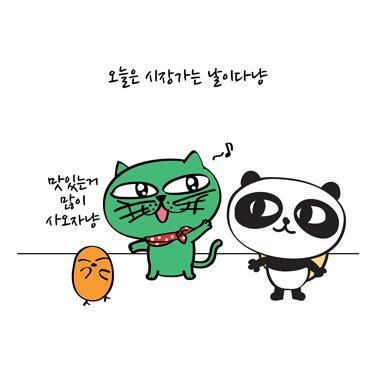 Caption: OKCAT COMICS EP.54 '무임승차' 옥캣 프렌즈의 오늘 이야기가 궁금하시다면? 이곳에서 확인하시라냥! 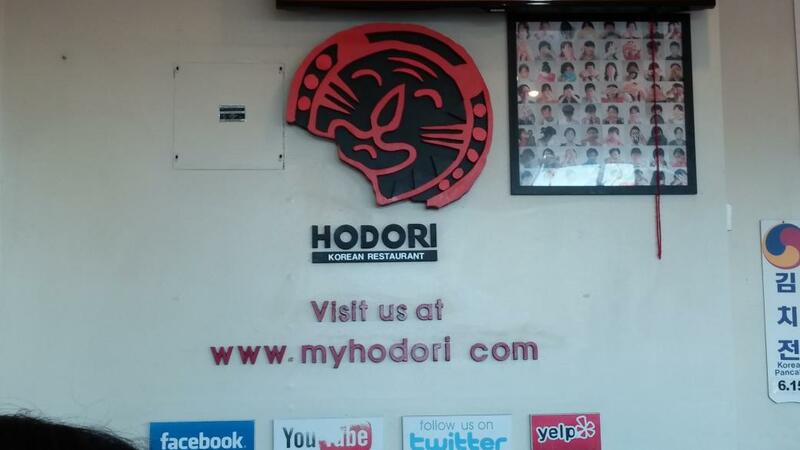 맛점하시라냥! 오늘 에피소드 SO CUTE! Ok Taecyeon Twitter, Wednesday, Nov 19 at 7:24pm [EST] or Thursday, Nov 20 at 8:24am [TST] 9:24am [KST]. 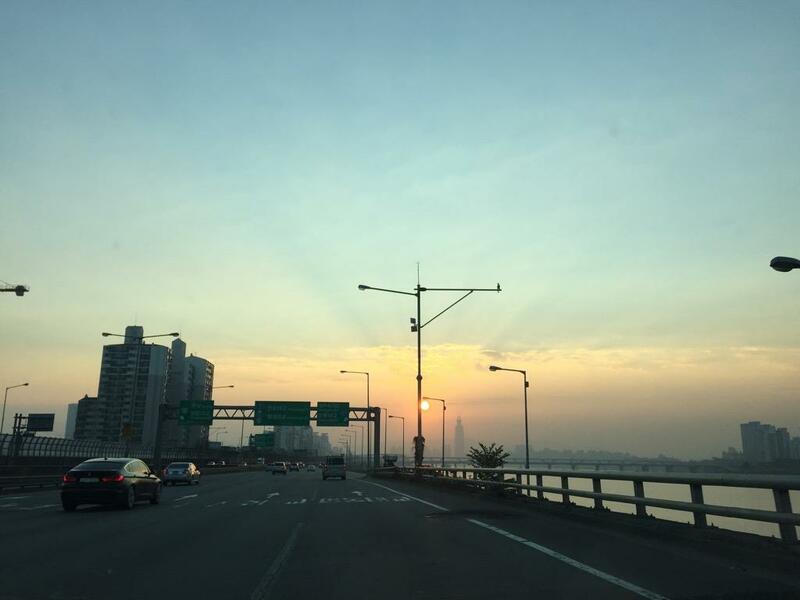 구름 한점없이 맑은하늘! 춥지만 맑으니 정말 좋다냥! MEOW! MEOW! MEOW! 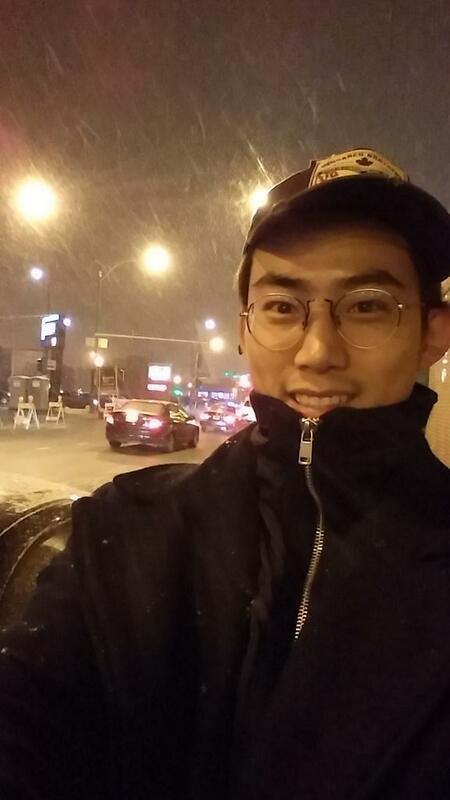 Oh my what is going on here haha...Taec had a girlfriend with him? Are you joking?? At this moment he went with his girlfriend in public like that he must be crazy, he didn't want to live any more hahah....I don't think Mr. JYP let him live in peace to date that girl at this moment. 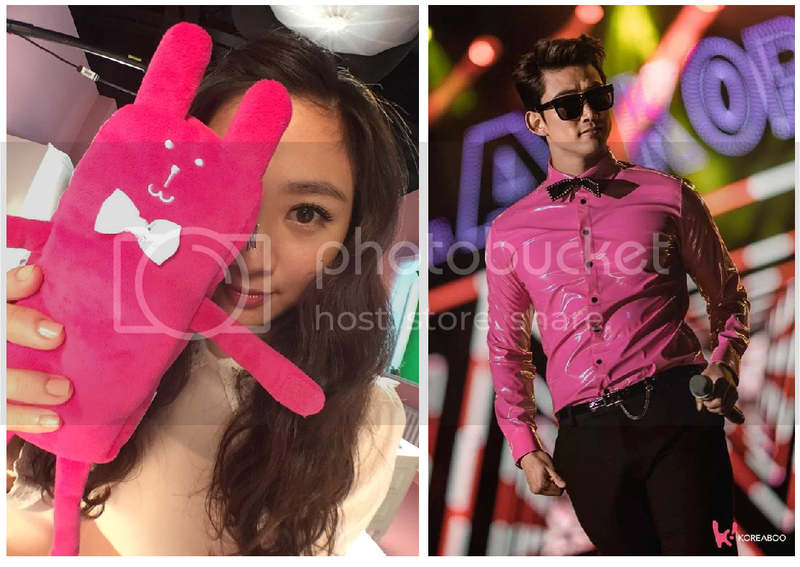 If Nichkhun can have a girlfriend, then the rest of the 2PM boys are allowed to have girlfriends, too. Otherwise, the other 2PM boys can complain about unfairness, favoritism, double standards, and inequality. The boys can't use JYP and the existent/non-existent dating ban as rationale for non-disclosure of their identity of the girlfriends. If they're keeping the identity private, it's because they want to keep it that way -- and not because JYP and/or JYPE management have ordered them not to engage in private relationships. Last year when they were promoting Grown, WY said on a TV show that JYP said to them, "from now on 2PM can date." I knew I read something about the ban being lifted for 2PM, but when I google-searched the article I couldn't find a single mention of the ban being lifted on 2PM. @#$% google. All the articles I could find were on Wonder Girls' ban and Suzie's ban blah blah. Do you happen to have the exact source? Or the name of the TV show? Taec: The dating ban has been lifted this year. From now onwards, if you want to date, you can go ahead! Thanks for looking this up, @cannakat. @lmangla, do you mind including this topic in the family blog... if you haven't yet? Thanks. The dating ban has been lifted. 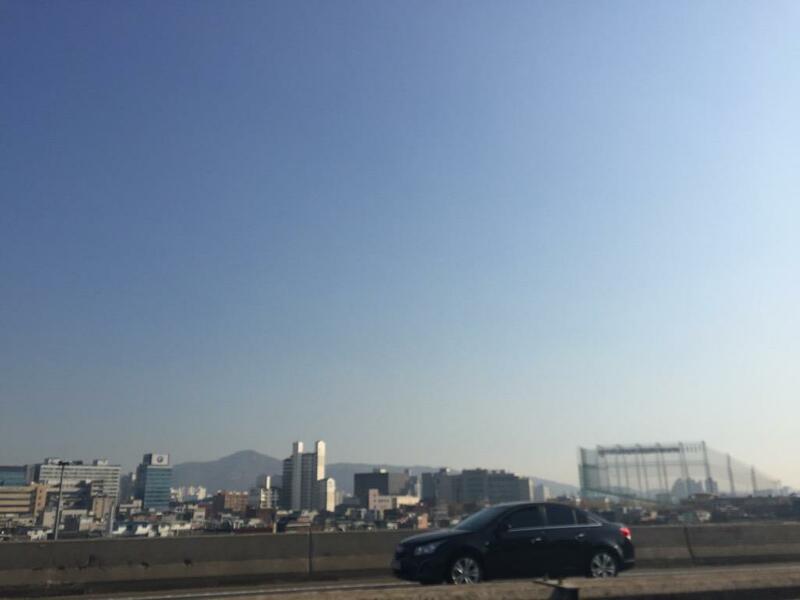 Taecyeon tweeted on November 17, 11:31pm Dallas Time, or November 18, 2:31pm KST. Tagging @chinlylin for the newsblog. Thanks. The K-pop band's acrobatic moves and candidness with the audience shined at the Prudential Center. 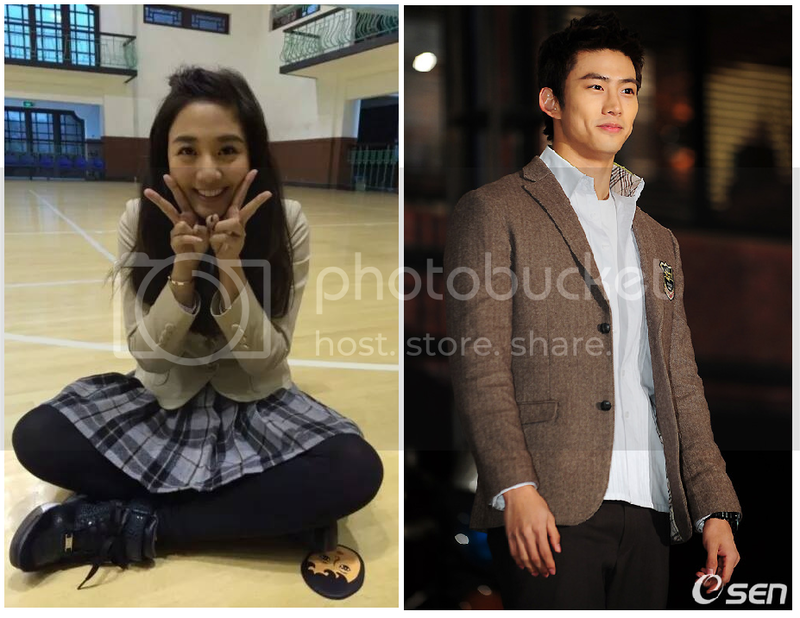 Nov 18 2014: guigui shares vid "falling in love"
This morning 10AM, Taecyeon sleepily walked to the cafeteria to eat breakfast, after he ate and drank he was chatting. Khun slowly walked out of the cafeteria and bought a magazine (it’s almost noon) holding the magazine, he leisurely walked over and greeted. New Jersey was raining and snowing but now it’s clear. Fighting for tonight’s concert! i thought he didn't like to eat breakfast? 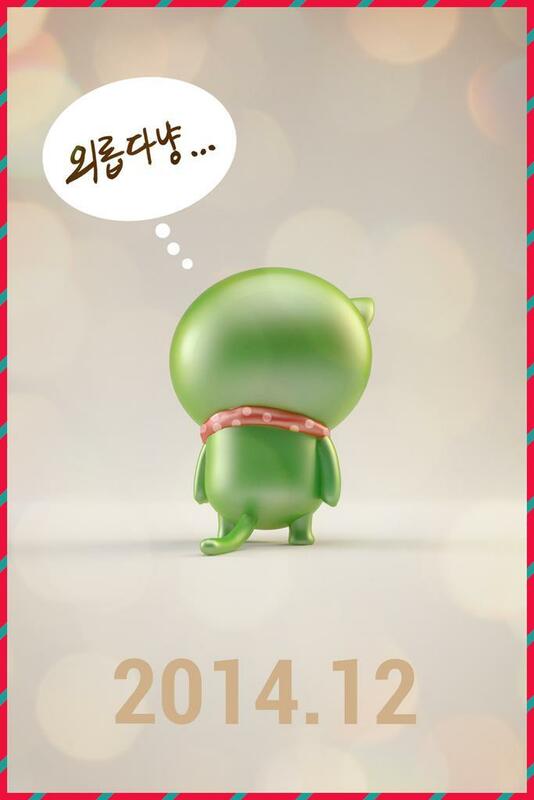 OKCat Twitter Monday, November 17, 2014 at 12 midnight KST or 11/16/14, 11pm TST, or 11/16/14 9am in Chicago. @lmangla. Here is the sequence of events for our family blog. Tagging @chinlylin, too, in case she wants some of the pics in the newsblog. I’m including some tweets from Khunnie, Wooyoung and other people to establish a better timeline. 6:45pm KST: Guigui’s FB: Fighting in class! 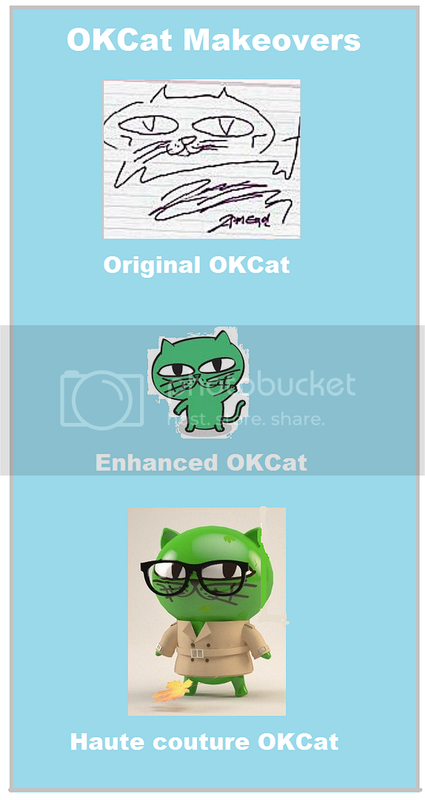 7:26pm KST: OKCat wishes CSAT takers good luck! *Taecyeon GAINED half-a-day . This caused the time confusion. It was still Wednesday, November 12 in the US while for TY who had flown from Seoul, it was past midnight on a Thursday. It can be disorienting. 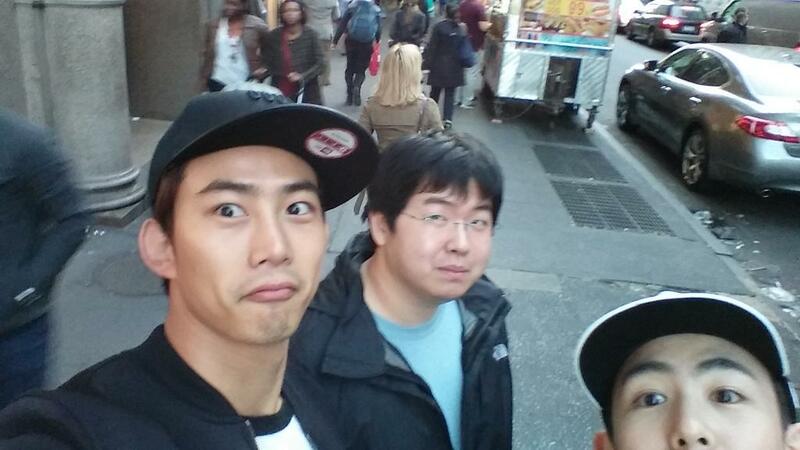 Nov 12: 4:51pm NYC, or Nov 13, 6:51am KST: Taeccool tweeted picture with Khunnie and friend, David Byun, in a NY street. Nov 12: 9:30pm NYC, or Nov 13, 11:30am KST: fantweet: Taecyeon was strolling down Times Square. *345 Hudson Street is the address of CBS newsradio and news. trans: Hestia nails 赫司緹雅國際時尚美甲 Ruby helped me draw Ohh la la... so awesome [thumb up] Everyone, quickly go and look for Ruby to do your nails also. OkCat Twitter, Friday, Nov 14 at 8:02pm [TST] 9:02pm [KST] 7:02am [EST]. Is that correct, @korchick, @minwooluv78? 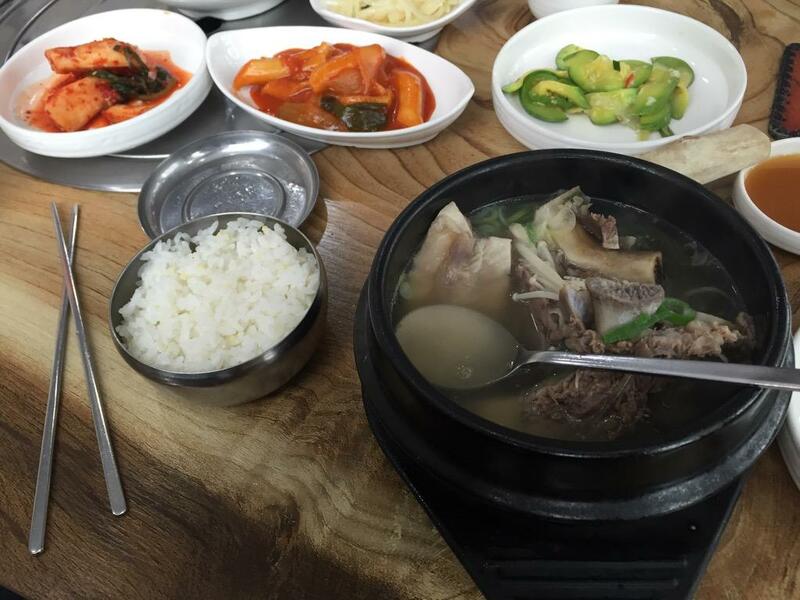 okcat: in a good mood, lunch, fire friday! 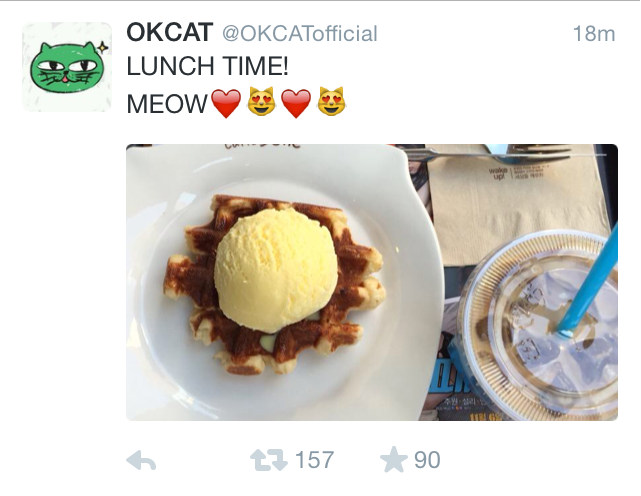 OkCat Twitter, Friday, Nov 14 at 1:53pm [TST] 2:53pm [KST] 12:53am [EST]. 배 불러요 주인님들! 냐냥! Masters/Owners, (my) belly is full/blown-up! Nah nyang! 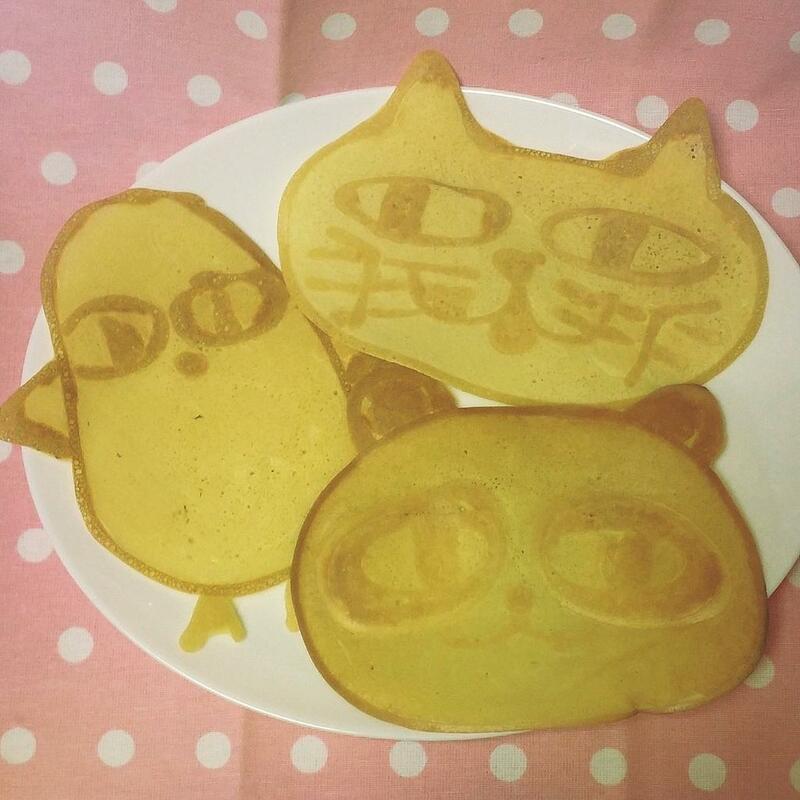 Awwwww... this is too cute to be eaten. 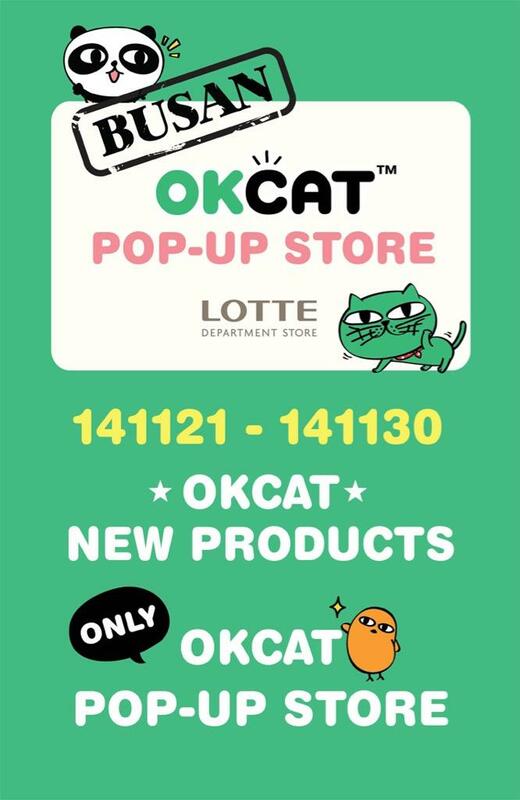 OkCat Twitter, Wednesday, Nov 12 at 11:00am [TST] 12:00pm [KST]. COUPLE HOT PINK. VERSION 3. 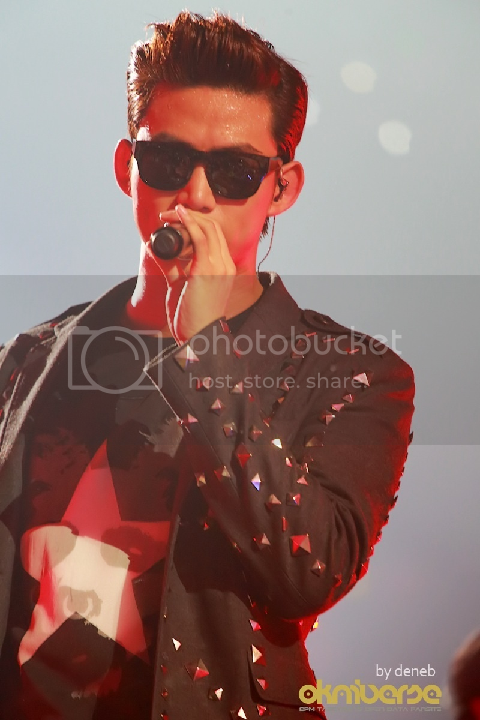 Ok Taecyeon Twitter, Wednesday, Nov 12 at 4:51pm [EST] or Thursday, Nov 13 at 5:51am [TST] 6:51am [KST]. oh boy today it seems like those studios had a pack to releases more wedding pictures lols ever seen this one before? Who do you want to have lunch period with? She changed her FB cover to this pic. What's this supposed to mean? ^♥^ Somebody with smiling eyes, sending/puckering up for a kiss? 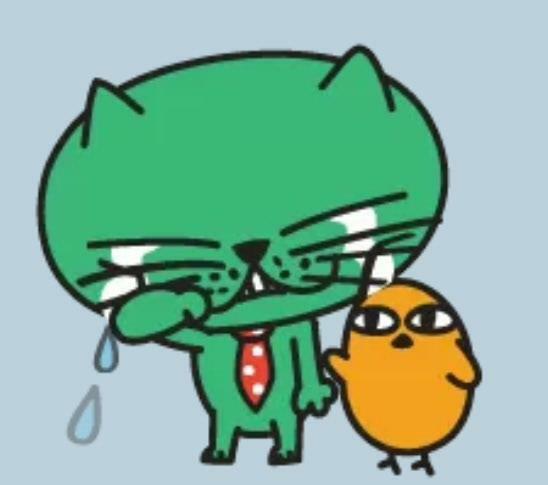 OkCat Twitter, Monday, Nov 10 at 8:16am [TST] 9:16am [KST[ with no picture. 춥다냥! 일교차가 크니 옷 따뜻한거 준비하시라냥! 냐냥! 오늘 하루도 홧팅!MEOW! Trans [By Google]: Nyan cold! The greatest diurnal temperature warm clothes're ready Step right meow! Nyanyang! Today is also the day hwaiting! MEOW! On the November 9 episode of SBS variety show “Roommate,” Nana, Sunny,and Lee Gook Joo went on a trip to the cafe strip of Samcheongdong and planned to arrange blind dates for each of them. After Lee Gook Joo said that she’s feeling lonely nowadays, hinting that she wants to go on a date, Sunny decided to match her with one of her friends. 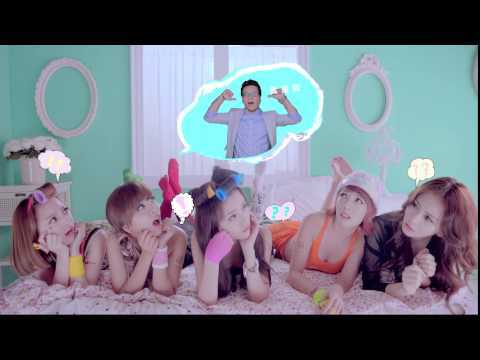 Sunny then called her friend, 2PM’s Taecyeon. OkCat Twitter, Sunday, Nov 9 at 7:40am [TST] 8:40am [KST]. Do you see the stars now? Typically, I’d dismiss this as ridiculous -- his fashion coordinator/noona made him wear silly star shirts and star sneakers. Q: what'll u do when drunken man annoy u? TY: Fight! 옥사장님의 두근두근 팬싸인회는 부산에서 진행되며, 날짜/시간/장소는 아직 협의중입니다냥! 정확한 사항이 결정되면 옥캣이가 트위터로 알려드리겠다냥! 옥캣이도 부산갑니다냥! 그럼, 11월 21일 금요일에 부산에서 만나자냥! 냥! 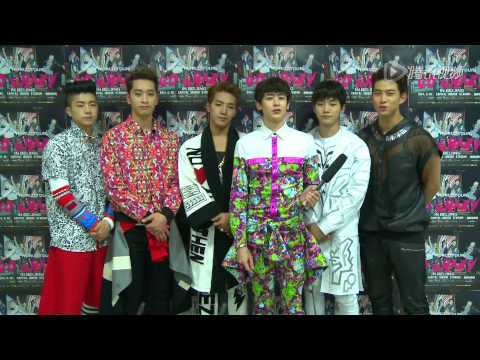 Here's 2PM Message for their World Tour 'Go Crazy' in Guangzhou. It was uploaded today, November 7, 2014, by Ohupika Dushichu. Thanks! When did Taecyeon become the Chinese speaker of the group? I thought it was Khunnie...errr...Nichkhun's role. Please, will somebody translate what he said? I know he was really saying, "I love Guigui from the bottom of my heart so please watch us in Guangzhou and buy our 2PM fan merchandise." Thanks. Last year, Saturday, June 22, 2013, 2PM had a Live Tour Concert in Seoul. He wore this. He uses "biong" for bye when he calls his mother. Didn't Jun. 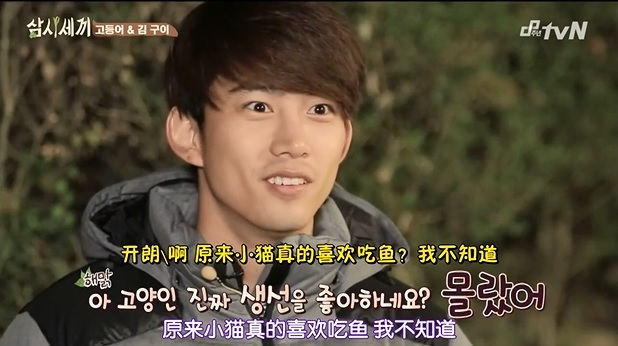 K tease Taec about "biong biong" last year?